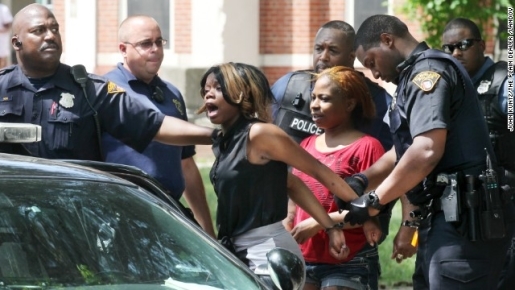 A kindergarten riot in Cleveland means 8 arrests. You would think that a kindergarten graduation would be a cause for celebration. After all, it’s a promotion from kindergarten to elementary school, it’s a milestone in a child’s life, and it’s the last gasp of babyhood for a young child. However, for some people, apparently a kindergarten graduation is a great way to get your beating on. Eight people were arrested after a kindergarten graduation turned into a riot. The graduation was at Michael R. White Elementary School in Cleveland, Ohio. The feud started between two teenage girls and then spread out, bringing in various relatives and family members until it was a full-fledged donnybrook, like the last of the peanuts were gone. The eight people were arrested and charged with aggravated rioting, which sounds like the most awesome charge ever. This wouldn’t have happened if there were a designated fight club room at the school, but here we are. The good news? No guns were involved and no kids were injured. The only confiscated weapons were a hammer and a stick.